Hornady's new magnum loads are hot stuff. Hornady's LeverEvolution bullet technology makes the stomping new .44 Magnum load a faster, flatter round with tons of penetration. Well, those clever guys and gals at Hornady have done it again. Perhaps you've heard of their LeverEvolution ammunition? They came up with a soft synthetic plug to fit into the hollow points of bullets. The soft plug allows them to create spitzer bullets that can be loaded into the magazine tubes of lever-action rifles. The soft tip, unlike the hard tips of hollowpoints or sharp-tipped softpoints, won't detonate the primer of the cartridge ahead of it. Lest you think it is some sort of urban myth or hunting camp legend, I've seen half a dozen lever rifles detonated in exactly that manner. The advantages are not just that you can use sharp-nosed bullets safely but that those bullets can have better external ballistics, lower drag, flatter trajectories and better-controlled expansion. While the extended range may not be that much, the expansion is. You might only extend you useful range another 25 or 50 yards. But as all modern ballistic technology is centered around the expansion of spitzer bullets, getting that new technology into a lever rifle is a big boost. So what does all this have to do with me, you ask? 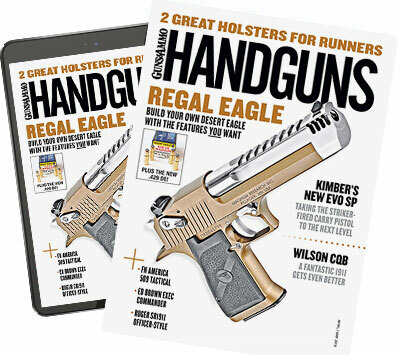 After all, this is a handgun magazine, right? Hornady extended the LeverEvolution technology into the .44 Magnum and .357 Magnum cartridges cartridge, and it is a heck of a load in handguns. I recently had the opportunity to test the .44 Magnum version. The bullet weighs 225 grains and has a spitzer shape with a soft polymer tip in it. Why 225? My first thought was the bullet would be too long. A spitzer-like tip and polymer insert makes a bullet longer, and you might need to trim weight to keep it light enough for stabilization in a handgun's rifling twist rate. Nope. The twist rates of .44 Magnum handguns are so fast you could add 100 grains weight to the bullet and still have it stabilize. No, it weighs 225 grains because that is all Hornady needed for expansion and penetration, and a lighter bullet with that shape will have a plenty flat trajectory. How much expansion and how much penetration? We shot the bullets into ballistic gel to check. From 50 yards the bullets penetrated 22 to 23 inches of ballistic gel. That's more than enough to get through and out the other side of a big game animal like a deer and even enough to get the job done on a black bear or a big ol' wild hog. Expansion? Classic, .650-inch-diameter mushrooms and only a slight amount of tipping at the end of the wound track. The bullets did not swap front for back as they sliced through the gelatin. At the range where I first shot the Hornady ammo, our host has some steel silhouettes out at 200 meters, and I found it easy to get hits as long as I paid attention to proper follow-through and ignored the recoil that was coming. For the recoil was not insignificant. As full-power hunting ammo, you'd expect it to be stout. And here you'd be right. I managed to score enough ammo to take home and test at my home range. There I shot some out of my favorite .44 Magnum, my four-inch nickel S&W Model 29. The recoil was even more ferocious than it had been out of the long-barreled hunting guns I'd shot in my first go-round with the ammo--so much so that I didn't even bother trying to check accuracy while shooting over sandbags. Such a "test" would be more a test of me than of the ammo. So I bolted Mr. 29 into a Caldwell HAMMR rest and got to work. Once I'd settled the gun into the inserts, the remaining ammo went downrange and produced some interesting results. Three six-shot strings produced three 21⁄2-inch groups, with five of the six clustered under two inches. I suspect that this particular M29 has one chamber slightly off-axis with the barrel--not uncommon in 30-year-old .44s and not so much that you'd see it shooting by hand or on a sandbag rest. But clamped into the machine, the one chamber throws (if you call a 21⁄2-inch group "thrown") its bullet a smidge out of the group. Were I hunting with this gun, I'd shoot groups and mark the chambers until I found the one that was off and then not load it or load it to come up last. And make no mistake, this is hunting ammo, not defensive ammo. First, the high velocity. Hornady expects 1,425 fps out of a long-barreled hunting revolver; I got 1,319 out of my four-inch gun. That means heavy recoil. In a defensive situation you don't need that power nor the recoil. Second, the penetration is excessive for defense. For defense you'd want a bullet to expand fully and get past the 12-inch mark. Much more than that and you risk excessive penetration, exit and extra hazard to bystanders; as noted, this ammo produced nearly two feet of penetration in ballistic gelatin. I'll leave it to the elk hunters to decide whether 23 inches of penetration is enough. I know that two feet of wound channel through elk with a rifle is plenty in many circles. As long as you aren't looking to break the shoulder with this bullet, I'd say it is plenty good enough. Whitetails? Does the reply "piece of cake" satisfy you? As if all this wasn't enough, the same ammo will work just fine in a lever-action .44 Magnum rifles or carbines. Those of you looking to go hunting with your cowboy carbines now have ammunition that's more than adequate to the task. In fact, you have a high-penetrating, expanding bullet with a flat trajectory and superb accuracy. Hornady will be loading all if these they make into ammunition, so don't expect to see these bullets as components for a while. Based on the performance I've seen, they'll have a hard time keeping up with demand on loaded ammo.